Already the recognised market leader for many years Geo-Fix is now joined by a new break through formula, Geo-Fix All Weather, that solves the perennial problem of applying jointing compound in wet weather. Geo-Fix All Weather has all the legendary time and labour saving benefits of standard Geo-Fix, supplied in ready mixed, vacuum packed, sealed foil bags to ensure the product is perfectly fresh, easy to brush into the joints and simple to point up. In fact the only difference is it can be applied in wet weather so you can still mop up sales even when it's raining! The time and labour saving benefits of Geo-Fix Jointing Compound, combined with the performance benefits compared to cement based mortar make it even popular with professional landscapers. general builders and DIY'ers alike. 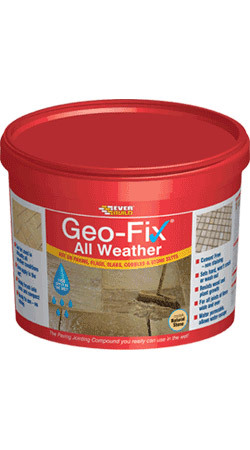 Now with wet weather compatibility Geo-FIx All Weather is set to become a firm trade favourite. Available in 14kg packs in two colours: Natural Stone and Slate Grey.